​So I'm trying to prep for email setup by copying some email addresses from "email" field on the Customer Card to the actual "To" field. And every time I go to tab off the field, GP just up and crashes. When you tab off that field in the Internet Information window the program wants to dialog with the installed Outlook Address Book folder and validate the email address you just entered. The TO, CC and BCC zooms go to these Outlook Address Books. The below window should normally pop. If it does not you are crashing. The Dex log will show. Start with checking your Outlook install and the functionality of the To, CC, and Bcc Zooms. PS - is it going to cause any of my users issues if I use SQL to copy the email from the (old) Email box into the new ToEmailAddress field? 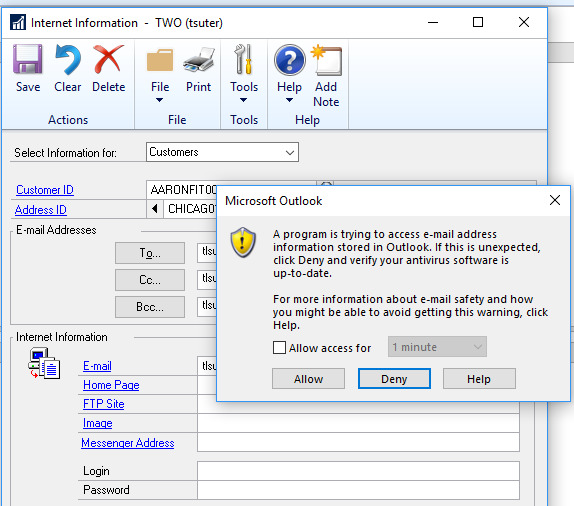 Try temporarily disabling your antivirus locally and see what happens before messing with Outlook. It may be interfering. Also check those three zooms: to, cc, bcc that they open the address book. Updating SY01200 emailTo.... from INET1, 2, 3 and so on is fine. I had a similar experience after trying to change the Email Message ID Setup. I then found out GP would crash (lockup) when trying to email invoices and PO's. This was right after an Office 365 update. I opened a ticket with GP support and the tech told me there's now a compatibility issue with one of my 3rd-party packages. I have been using GP 2013 email functionality and Office since 2013. I switched to Office 365 in 2016. I have GP 2013 Production and GP 2018 Test both having the same issues. I manually rolled back the Office update and GP email worked from the start of December until two weeks ago. Now I'm getting intermittent errors and GP locking up with all versions of Office 365. I can get the Invoices to email in GP 2018 if I uninstall all customization and 3rd party packages. I'm trying to figure out a consistent workaround for GP 2013. I don't know if it's related to your problem. If GP locks up when you try to email a test invoice, it would sound like the same issue. ​We had to roll back to a previous version of office because we lost the ability to convert GP documents to PDF's. At first I thought it was an Adobe thing, but come to find out a couple of weeks later it was all Office's doing. We had to disable automatic updates and roll back. Still not sure if they've properly addressed the real issue. So far I haven't been impressed with Office 365's automatic updates. We've had more problems caused by those things (Adobe integration, service disruptions, etc.)... I'm decidedly sour on the whole notion. To me, the mantra "if it ain't broke, don't fix it" applies. You want to push out a new version, that's fine. Just let us TEST the thing before we roll it out and break critical core processes for the entire organization.